To the best of my knowledge Martin's car is the only complete car used in the filming of Christine still shared with the public in the USA. Martin is very active in the hobby and he has encouraged hobbyists for several years in keeping Christine in the public eye. He was also instrumental in the founding of the CCC in 2005 having been kind enough to give his blessing and visit from time to time. This recent video is a fitting tribute to a guy who's early life mirrored Arnie's in more ways than one. See for yourself! Was this Christine in Lake George ny this past weekend? Ok thanks. Boy wish i knew who it was. They are on here. Was wearing a club shirt and i had my Christine movie shirt on. Which after i sat inside was walking and nearly had an attack. I over heated like a car would. Very cool. 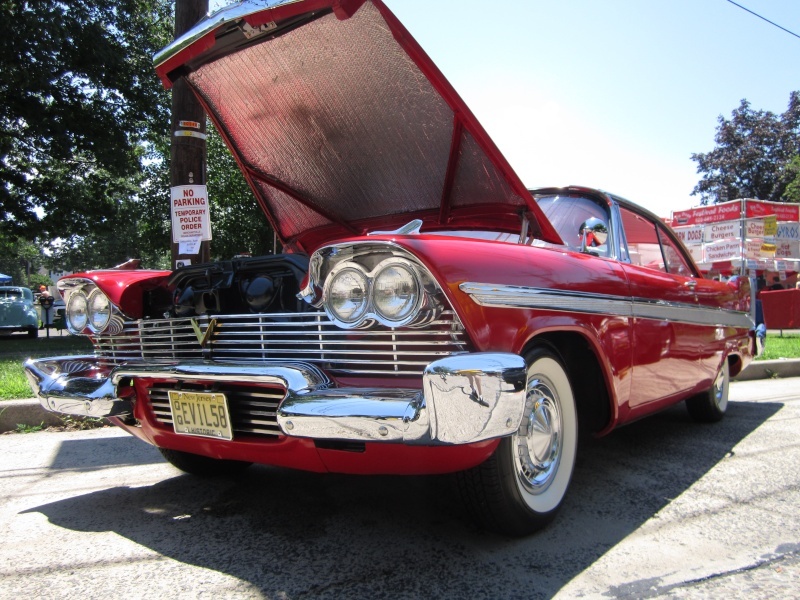 I don't blame you, until i joined the club i had never seen a Christine car at any of the car shows i went to. He shouldn't be too hard to find if he had a club shirt. What an amazing story! And what a car! Im glade he has it. He truly has the heart for it. Its in good hands! I just saw Martin on an episode of the Car chasers...He was selling his Terminator 2 Harley Fat boy. A true labor of love. Myself I just purchased a nice daily driver Christine last Sunday, (: Looking forward to restoring her. A bit of lore about the movie that I had taken as fact but isn't. This might be old news to you, and maybe you saw it where I did, but on a Christine page on Facebook where Malcolm Danare is a member, Malcolm has said no rubber was used on the body of the car in his scene. yes i talked to Malcum Danare "Moochie" in person and he said that the car being crushed was all steel and was quite frightening, there was rubber parts used but they were ditched because they did not look "realistic"
I always wondered if there was any rubber parts used. I bet that was very frightening standing there as the car is being forced into that loading dock space. Yikes!! Good info Joe! There was absolutely NO RUBBER anywhere on that car when my death scene was being shot. The car was being pulled from behind the cement wall by a bulldozer. The cable was between my legs. If there was rubber anywhere near that car, it was in my head for agreeing to stand in front of Christine, in that loading dock! And by the way... Wikipedia has no idea what they're talking about! LOL... You heard it right from Moochie's mouth. Good info Serge! Can you imagine the tension on that cable pulling that car into the loading dock!? LOL. I give Moochie credit for being brave to do that one! Having a cable between my legs like that nothing but bad things come to mind! If you know what I mean! LOL. And all this time I thought the car was being pushed from behind by the bulldozer. Someone even made a diorama of that scenario. What's silly about the Moochie scene is he could have climbed over the car to get out, then run up a fire escape or something, where she couldn't follow him. Still, that Malcolm was actually scared adds to the scene. Like how Hitchcock manipulated his actors (to get the performance he wanted, he'd be nasty to an actress) or Method acting.